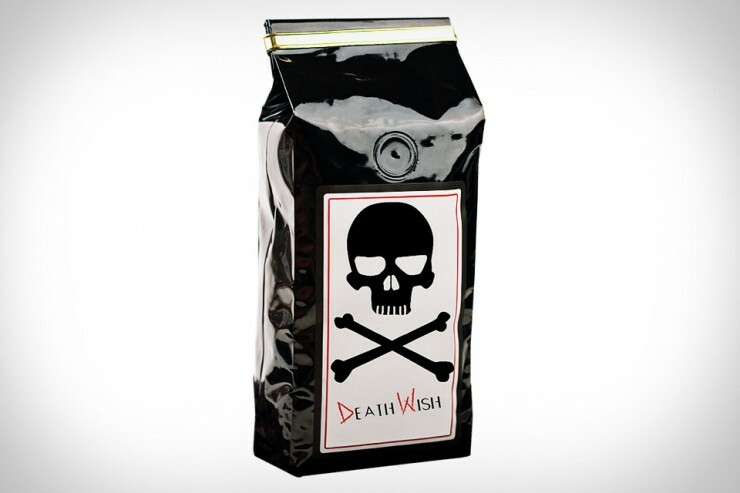 Death Wish Coffee: Hands (And Lips) On | OhGizmo! Many blogs have been reporting on the Death Wish coffee you see above. Its claim to fame? That it contains twice the amount of caffeine found in regular coffee. The company sent us a bag and we’ve been soaking up the caffeine like stressed out freshmen during finals week. What do we think? Well, how you feel is a very subjective thing, one especially susceptible to suggestion. So the mere thought that we’re drinking coffee with extra caffeine might be leading us to feel as though there really is more in every cup. But… well, we do think we get an extra kick; it’s like a sugar rush alongside the smooth caffeine soar we typically get. However, it’s not anything that had us shaking, twitching, sweating, or thinking we’d have a heart attack. It just seems to have that extra jolt, one that’s very appreciated on a slow Monday for example. As for taste, we’d describe it as nutty and robust but not overpowering or burnt. It was tasty and we’d be inclined to have more even if there was no power punch promise. At $20 a bag, it’s also reasonably priced. Reminiscent of the Black Death vodka, tequila and rum that used to be for sale in the 90s and which, according to a Google search, is having a renaissance.